The Dutch horticultural umbrella Royal Flora Holland has set up a vis-ual dashboard allowing on-landing border clearance. It was developed within the framework of the EU-funded CORE project. CORE stands for Consistently Optimised Resilient Secure Global Supply Chains. Its aim was in protecting and securing the supply chain and reducing its vulnerability to disruption through improved data collection. The CORE project was coordinated by the European Shippers’ Council. 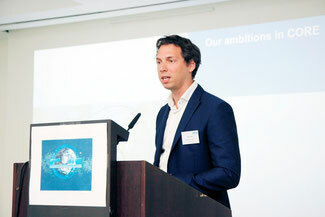 “The need for a better grip on the supply chain was initiated by the finding that once goods have been put into the box and start flowing outside the selling company’s walls, the rest of the supply chain is shrouded in mystery,” ESC’s secretary-general Nik Delmeire said at the final CORE event in Brussels. The companies and government offices participating in CORE had to come up with some actual results, the presentation of which was the aim of the event. The Royal Flora Holland solution was one of these. Mr Mestre was the first to bring in the air cargo element into the event, as his own field of expertise is in aviation. “A modus in which, due to its urgency, security levels are more advanced. Air cargo security is extremely complex,” he added. Mr Mestre reminded listeners of the 2012 mutual recognition agreement with the U.S. and the so-called ACC3 regulation to deal with air cargo coming in from third countries. He admitted that over the years digitalisation is playing a more and more critical role and is becoming a key element in transport security. Those remarks prompted Ben Radstaak, director of Air Cargo Netherlands, to pose the question if cyber security would be taken into account in the review and upgrading of the ‘regulated agent’ known shipper’ regulation. To which Mr Mestre answered that ‘it would be looked into’. A dedicated air cargo project was Royal Flora Holland’s supply chain redesign driv-en by a data pipeline. It was developed in collaboration with Intrasoft, Delft Tech-nical University and the Netherlands Organisation for Applied Scientific Research, TNO. Royal Flora Holland is a cooperative joining all the parties in the horticultural industry and managing their supply chains with the Netherlands as its hub. So, using a Descartes pipeline a ‘visual dashboard’ was set up, gathering data not only from the orders, but also the ‘expected time of arrival’ (ETA) data provided by the Schiphol control tower as well as customs inspection and release notifications. “Improving visibility allows for pro-active (re-)planning,” said Mr Huiden. On the growers’ side, the shipment number order info as well as data phytosanitary data are provided. The air cargo parties have to come up with HAWB and MAWB numbers, as well as shipment status. In AMS this data flow is supported by the Cargonaut system. As a result, Royal Flora Holland has adopted the visual dashboard as a commercial platform. Customs and the Netherlands Food and Consumer Product Authority will continue the concept of clearance at landing.